British online supermarket Ocado has already made huge strides to automate its operations, using pick and pack robots in its warehouses and trialing self-driving delivery pods in London. Now it's looking to give its human maintenance technicians a helping hand with the SecondHands project, and has just unveiled its first robot assistant test prototype named ARMAR-6. 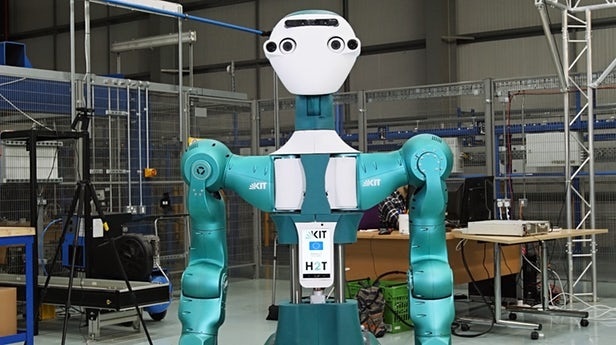 The EU-funded SecondHands project's purpose is to build a helper robot that will literally provide an extra pair of hands to maintenance and repair technicians working at Ocado's automated warehouses. This could be simply providing physical support for structures while the human techs are working, bringing equipment or materials when and where needed, taking over when the job calls for machine-level precision, or even predicting what's required to complete a task. "So for example, if it observes a technician attempting to change a panel and requiring a set of tools, it will come and offer its assistance – either by holding the panel for the engineer or grabbing the various tools that are needed."